Following the U.S. Federal Reserve's decision to lift the foot off the gas of its aggressive bond-buying program, the consensus expectation has been for both U.S. Treasurys and gold to lose value. However, Tim McCullough, technical strategist at Lloyds Bank Commercial Banking has different ideas, expecting both to test recent highs. McCullough uses DeMark Indicators, which are a collection of sophisticated market-timing tools created by Thomas DeMark, the founder and CEO of DeMark Analytics. The outcome, he says, is gold bulls should look to load up on more bullion. "Gold still has to retest that $1,921 area higher again at least up to around sort of the $1,700 area before that long term trend can be exhausted," he told CNBC Wednesday. "The combination of the downtrend trend reaching its own exhaustion pattern and the long term trend still being intact suggest that the risk now is to the upside." The price of gold fell by 28 percent in 2013, sharply lower than all-time highs near $2,000 an ounce in 2011, when a worsening debt crisis in Europe sparked buying of safe haven assets. 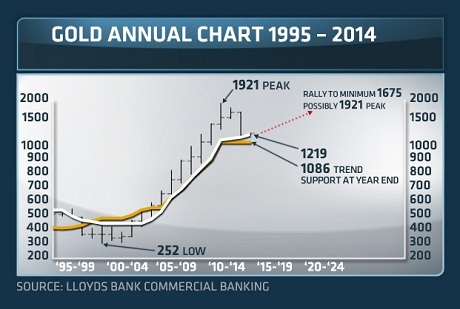 Gold enjoyed gains of nearly 30 percent in 2007, 2009 and 2010. In the 10 years up until last December, the price of gold nearly quintupled, as investors sought a haven from low interest rates, extra liquidity from the U.S. Federal Reserve, and concerns over the global economy. Gold has since been in a significant correction, McCullough said. Instead of the price falling back to $252 an ounce seen in 1999 at the start of this trend, he sees it turning back higher but concedes that it could take several years. McCollough also expects the yield on the 10-year Treasury - which moves in the opposite direction to its price – is ripe for a turnaround. "We had two exhaustion patterns...I'm looking for a third one to complete shortly somewhere around the 3.08 (percent), possibly extend to 3.28 (percent)," he said. 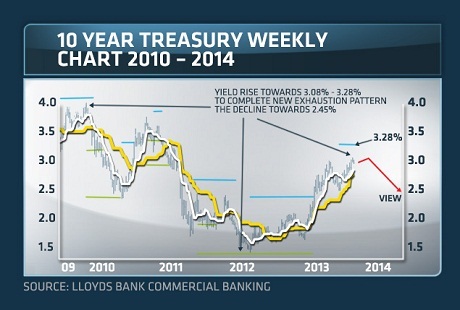 "Around that area I would look for Treasurys also now to begin to find a top and then to reverse lower again." Several investments banks have said they expect Treasury yields will gradually grind upwards this year as the Fed reduces its bond buying. Societe Generale stated at several points in 2013 that it expects 10-year yields to be in the region of 5 percent by 2017. When quizzed on whether extraordinary stimulus measures from central banks may have distorted the market and therefore the charts, McCullough remained defiant. "The chart shows they've worked in the past," he said. "Investors are really trading on the back of where they think everyone else is going to be trade next."